I want to say a quick thank you to our guest, Noella, today. She's offered up this fantastic list of must have dog accessories. I'm excited to learn about a few of them like the Zoom Brush and Whistle. I've never heard of them before, but after reading about them I think they sound terrific! Please enjoy this awesome list and let us know what dog products you can't live without. We love our dogs. Some folks are always going to look at us like we are insane for lavishing so much attention (and money) on our animals, but we just don’t care. You know why? Our dogs deserve it! These are the hottest must have doggie accouterments RIGHT NOW. 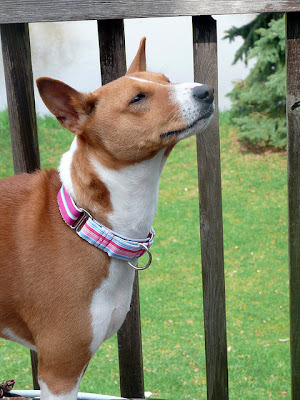 5) Martingale Collar. These collars are the perfect blend of form and function. Sans buckle, they slide over your dog’s head and tighten only when your dog pulls. Because they are made out of fabric instead of chain they do not cut into your pet’s skin. When paired with a pattern that complements your pup’s coat, they make for a very elegant collar. 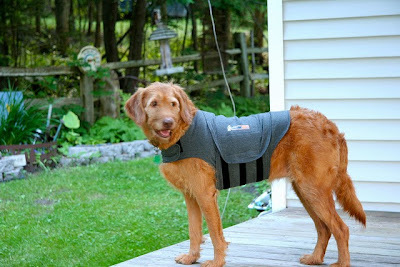 4) Thundershirt. I know I know, Thundershirts? Those are so 2012! However, they are still an excellent remedy for dog anxiety. They won’t work for every dog, but when they do, its a life changer. Check out the new selection of “polo” style shirts in pink, blue and green, and don’t forget monogramming! The Zoom Brush made by KONG. 3) Zoom Brush. My dogs go NUTS for the this brush. Think of it as brush/massager combo. 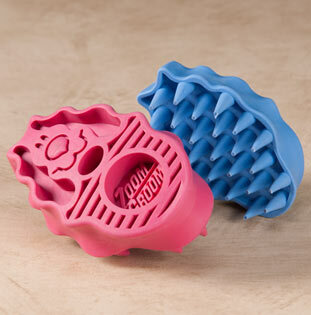 It is made of a soft but durable rubber with thick cone shaped bristles. It stimulates their follicles for a healthy, shiny coat, and is great for shedding, too! Your pups will want you to brush their bellies all day. 2) Yogibo Dog Bed. Yogibos are super popular for humans, but did you know they make dog beds too? They are well crafted and ergonomic. Your pup deserves a comfy bed, so hook them up with a Yogibo! They come in a range of sizes and pretty colors, in two styles. 1) Whistle. No, not that kind of whistle. This is the latest in pet tech. They are small devices (about the size of a USB stick) that clip to your dog’s collar and track their activity throughout the day. There are a few similar devices being brought to market soon, Fitbark among them. With built in GPS, they keep track of exercise and nap time and sync to a smartphone app that analyzes and reports trends. All this info allows you to get that much closer to your dog and meet their needs. Noella Schink is a writer and dog owner/lover from Portland, Maine. She is rarely seen without her 8 year old shih-tzu Brutus in tow. When she and Brute travel around the country, she looks to Harry’s Picks, the newest online community for dog owners and dog friendly businesses, for the best tips and reviews on dog friendly hotels, restaurants, dog parks and more. *This post contains affiliate links. When you make a purchase using these links, we make a small commission. Thank you for your support! We agree the zoom brush is pawsome. Have a tremendous Thursday. Great products! We use harnesses for walking, but I've been very tempted to try martingale collars. Great top products, if only a pig agreed! Those look really nice but I hope the Whistle doesn't find us cats! Have to say I love the red cushion! Some pretty cool stuff! Thanks for sharing! Ooh, the Whistle sounds interesting! Who doesn't love the newest techie gadgets?!? Great products. The Whistle looks really cool! Lots of good stuff here, all of which we haven't tried yet, lol. You'd think we'd have at least tried ThunderShirts by now. I'm with my dogs 99% of the time, so I know what they're doing... but if I had to be gone a lot, the Whistle would be pretty cool. I have the kong groom! Good for baths to help lather into my thick fur! Those are some great products! The Whistle is really cool! The bumper bed looks comfortable.